kbculture: Come and Get It! Over the years, fads in refrigerator design have brought us shelves that rotate and elevate—but this is my first encounter with a pull-out pantry feature. 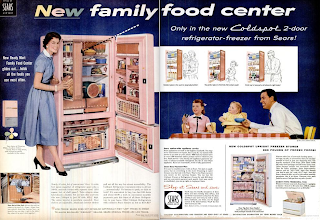 I do wonder, though, if this 1957 Coldspot fridge was really so deep as to require such a device; from the look of things, a standard-size watermelon fills up the shelf quite handily. In a way, this model is the appliance ancestor of the drawer-style units we have today; the 'Family Food Center' just escaped from the cooler compartment and adopted a horizontal orientation under the counter.